It restructures and provides long lasting volume without weighing the hair down. Moisturises dull hair and adds shine. Macadamia Oil: An excellent source of vitamin E, with a moisturising, antioxidant, anti-frizz action. Wheat Amino Acids: Conditions the hair, penetrating deep into the hair structure to improve and regenerate sensitised areas. Keratin and Soy: Increases moisture, intensifies shine, improves the condition of the hair, strengthens it and makes it easier to comb. Ceramide A2: Strengthens and makes it more vital by restoring cell cohesion, essential for the structure of the hair. Creatine: Protects against the damaging effects of styling, brushing and combing. Also increases body and volume, so dry hair becomes more manageable and easier to handle. 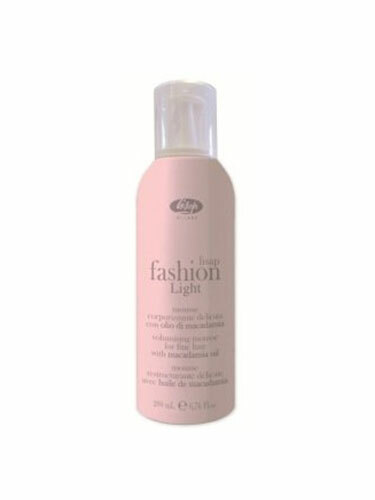 For thin, dull, normal hair: Apply after applying Lisap Fashion Light Shampoo, leave for a few minutes and then rinse out. For thick, dull, normal hair: Apply after applying Lisap Fashion Light Shampoo, comb through, leave in and style.